The Most Reverend Alfred A. Schlert, D.D., J.C.L. 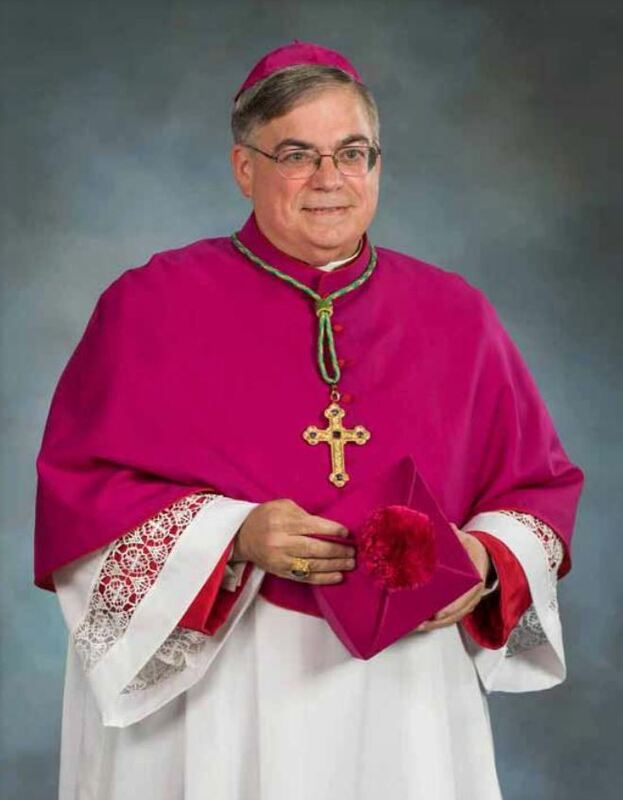 Bishop Alfred A. Schlert was born to Alfred and Marylou Schlert in Easton on July 24, 1961, and was educated at St. Jane Frances de Chantal Elementary School, Easton and Notre Dame High School, Easton. He prepared for the Priesthood at St. Charles Borromeo Seminary, Philadelphia, the Pontifical Roman Seminary, Rome and St. John Lateran University, Rome. He was ordained a priest at the Cathedral of Saint Catherine of Siena, Allentown on September 19, 1987 by The Most Reverend Thomas J. Welsh, Second Bishop of Allentown. Pope St. John Paul II named him Chaplain to His Holiness with the title of Monsignor in 1999. Pope Benedict XVI named him a Prelate of Honor, the second highest rank of Monsignor, in 2005. Bishop Schlert served as Vice President of the Pennsylvania Catholic Conference and as a member of its Administrative Board. He also served on the Diocesan Council of Priests, the Diocesan Finance Council and the Diocesan College of Consultors. He was a member of the Board of Trustees of DeSales University, Center Valley, Pennsylvania. Heraldic Achievement of The Most Reverend Alfred Andrew Schlert, D.D. J.C.L. The bishop’s coat of arms is composed of a shield, with its symbols, a motto scroll, and traditional external additaments. The shield, which is the central feature of any heraldic device, is described, or blazoned, in archaic terminology developed in the mid-12th century when heraldry took root. 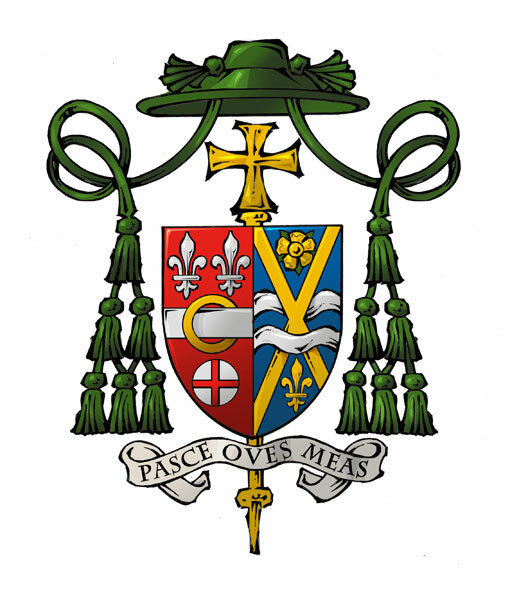 By heraldic tradition, the arms of the bishop are impaled with the arms of his diocese on the same shield, with the diocesan arms on the viewer’s left (dexter), and his personal arms on the viewer’s right (sinister). 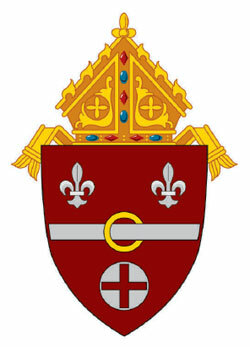 The arms of the Diocese of Allentown were devised shortly after the diocese was established out of the Archdiocese of Philadelphia by His Holiness, Pope Saint John XXIII in 1961. The arms of the Diocese of Allentown are blazoned: Gules a barrulet Argent encircled at fess point by a ring Or between two fleurs-de-lis Argent in chief and a cross Gules on a plate in base. The red (Gules) background of the shield recalls the ardent devotion to the Church of Saint Catharine of Siena, the patronal saint of the Cathedral of the Diocese of Allentown, which led to the return of Pope Gregory XI from Avignon to Rome. The golden ring on the silver bar (a barrulet Argent encircled by a ring Or) is a representation of the ring, given to Saint Catharine by 34 Our Lord during an apparition, signifying her mystical marriage to Christ. The two silver stylized lilies (fleurs-de-lis Argent) are taken from the coat of arms of Pope Saint John XXIII to honor the Pontiff who established the Diocese of Allentown. On the Pope’s original arms, they signified the Blessed Virgin Mary and Saint Joseph. The silver roundel bearing the red cross (a cross Gules on a plate) is derived from the three such roundels on the coat of arms of the Archdiocese of Philadelphia. This commemorates the Archiepiscopal See which gave the Counties of Berks, Carbon, Lehigh, Northampton, and Schuylkill to form the territory of the Diocese of Allentown. These roundels were, in turn, taken from the coat of arms of the Penn family, the Proprietors of the Province of Pennsylvania Colony, who, in 1733, authorized the first legal public Catholic Mass in the British Empire since the Reformation. His Excellency’s personal arms are blazoned: Azure a saltire Or interlacing two bars wavy Argent between a rose Or barbed Vert in chief and a fleur-de-lis Or in base. The blue (Azure) field represents the all-encompassing mantle of our Blessed Mother. The gold decussate cross (saltire Or) is the X-shaped cross of Saint Andrew, the Apostle who first followed Christ, and gives homage to Bishop Schlert’s middle name, Andrew. The two gently undulating white lines (two bars wavy Argent) reference his native city of Easton in Northampton County, Pennsylvania at the confluence of the Delaware and Lehigh Rivers. The gold rose with green leaves (rose Or barbed Vert) is for the Bishop’s devotion to Saint Thérèse de Lisieux, called “The Little Flower of Jesus,” as well as a reference to his mother’s maiden name of DeRose. A gold stylized lily (fleur-de-lis Or) is carried-over from the arms of the Diocese of Allentown, where it represents a personal devotion Bishop Schlert has to the Blessed Mother. Below the shield, a scroll is inscribed with His Excellency’s chosen episcopal motto Pasce Oves Meas (“Feed My Sheep”) taken from the Gospel of Saint John, chapter 21, verse 17. For Bishop Schlert, these words serve as a mandate from Christ at the beginning of each day and an examination of conscience before retiring at the end of each day. 35 Above the shield is placed a low-crowned, wide-brimmed hat, known as a galero. The ecclesiastical hat has been used by members of the Church hierarchy since first granted by His Holiness, Pope Innocent IV at the Ecumenical Council of Lyon in 1245. A bishop uses a green galero with twelve tassels, called fiocchi. Lastly, behind the shield of a bishop is placed an episcopal cross, signifying the bishop’s authority and governance in his diocese. The golden ring on the silver bar symbolizes St. Catharine of Siena, the titular saint of the Cathedral of the Diocese of Allentown. The ring designates her mystical marriage to Christ, a ring given to her by our Lord in an apparition. The red background of the diocesan shield signifies the sufferings of Catharine at the hands of her parents, and recalls her devotion to the Church leading to the persuasion of Pope Gregory XI to return from Avignon to Rome. The two silver fleurs-de-lis are taken from the coat of arms of His Holiness, Pope John XXIII, to honor the Pontiff who established the Diocese of Allentown. The silver roundel bearing the red cross is derived from the coat of arms of the Archdiocese of Philadelphia to commemorate the See which gave the Counties of Berks, Carbon, Lehigh, Northampton, and Schuylkill to form the entire territory of the Diocese of Allentown.